Makes 12 servings. Recipe adapted from The Recipe Critic. Fresh fruit of choice: raspberries, blueberries, strawberries, pineapple etc. In a food processor or blender, grind up the graham cracker sheets into fine crumbs. If you don’t have a food processor, simply place them into a bag and crush them with a rolling pin or cup. Place the crumbs into a bowl and add cinnamon and sugar. Melt the butter and add it to the graham cracker crumbs and mix well. Line a cupcake pan with paper liners and put one tablespoon of the crumbs into the bottom of each cupcake liner. Press down the crumbs with your hand or spoon. Set aside. In a large bowl or mixer, whip the cream cheese, vanilla and sugar until fluffy. Add the Cool Whip and whip until smooth. 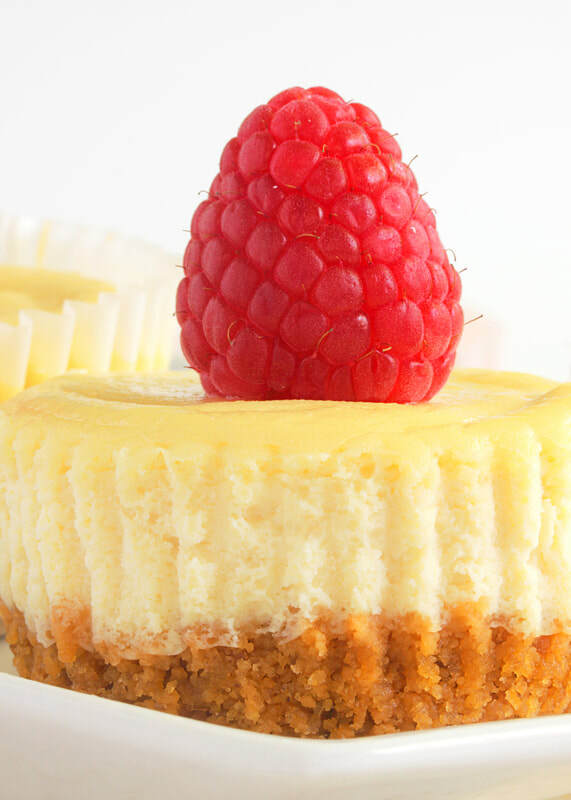 Using a cookie dough scooper or spoon, fill each cupcake liner with 1 ½ scoops full of the cheesecake mixture. Each liner should be filled almost to the top. Place the cupcakes in the fridge for a few hours to set up and become firm. Top with a piece of your favorite fruit.